Residents and tourists alike were thrilled to see the Queen of Hills and the surrounding hill ranges donning a white mantle today. This winter has been different in Mussoorie, as it has been waiting for snow till this day. The overnight ominous clouds finally obliged with the shower covering the town with white blanket of snow. The Punjab team won the 26th Banke Lal Shah Under-15 Memorial Cricket Tournament by defeating the Purvanchal Cricket Academy, Benaras, by eight wickets in the final match here today. After winning the toss, the Punjab team elected to bowl first. In the first innings, the Benaras team scored 49 runs all out. Rohit was the top scorer with 15 runs. Raghav and Harpreet took two wickets each for the Punjab team. In a shocking incident that occurred at a hotel in Mussoorie, a personal security officer (PSO) of tourist children allegedly pointed pistol at local shopkeepers after a petty altercation on the issue of throwing a glass on a road today. United Progressive Alliance Chairperson Sonia Gandhi will be in the state on January 15. According to Congress sources, Sonia will be addressing a public rally at Boraree Stadium in Tehri Garhwal district on January 15. A clean and green city with open spaces is the dream of every city resident but sadly the cities in the country are infested with garbage, encroachment and concrete buildings with very little green cover. The cities of Uttarkahand, a hill state known for its lush green trees, are no exception as well. International Skaters- Yati Gupta of St Joseph’s Academy, Dehradun, and Ashwin Raj and Abhishek Bhandari of KV IMA won their respective competitons in the 8th National Ice Skating Championship organised by the Ice Skating Association of India at Shimla, Himachal Pradesh on Thursday. Dehradun, January 7 Doon Star and Garhwal Sporting won their respective matches in the ongoing Ram Bahadur Chhetri Memorial Football Tournament here today. Two persons were killed when the car they were travelling in fell into a gorge at Shivpuri today. Residents and tourists alike were thrilled to see the Queen of Hills and the surrounding hill ranges donning a white mantle today. This winter has been different in Mussoorie, as it has been waiting for snow till this day. The overnight ominous clouds finally obliged with the shower covering the town with white blanket of snow. Children, in particular, came out of their houses wearing woollens and frolicked in the first snowfall of the season by hurling snowballs at each other. The belated snow and rain also brought cheers to farmers, especially the apple growers from Mussoorie-Dhanaulti apple belt, whose crops had been affected by the prolonged dry spell. While the town received 2 to 4 inches of snow, the adjoining tourist spot at Dhanaulti recorded five to eight inches of snow. The high reaches of Naag Tibba and surrounding peaks were receiving heavy snowfall since last night. The snowfall accompanied by high-velocity icy winds snapped power transmission lines at some places and disrupted the services temporarily. Electricity Department officials had to come out in the bitter cold to fix the faulty lines amid the snow showers, making it difficult for them to work. sky. “My family had arrived in the town yesterday and was lucky to witness the snowfall here,” added Neena. With the Met Department predicting more snow and rain, the tourists have extended their stay for a day more. However, birds and wild animals were seen having a torrid time and were seen huddling close to each other to avoid the bitter cold. Old residents of the town were of the view that the snow had become a rare incident now. RS Sharma, a senior citizen, said that the town that used to witness more than 12 feet of snow in the past, blamed the rampant construction and global warming for the decreasing snowfall in the town. Dehradun: Cold wave conditions prevailed in the state as the higher reaches experienced snowfall. Many parts of the state witnessed rain spells in the past 24 hours. According to Executive Director of the Dehradun Meteorological Department Anand Sharma, rains or snowfall is likely to continue in higher reaches of the state. Similar condition will prevail in other parts of Uttarakhand till Sunday morning. Meanwhile, last night rains disrupted traffic movement on the roads. According to the Disaster Mitigation and Management Centre, Dehradun, Dharasu-Barkot National highway has been blocked at Radi whereas the Rishikesh-Gangotri National Highway has been blocked at Harshil in the Uttarkashi district due to snowfall. PITHORAGARH: Passengers from Munsiyari en route to the district headquarter of Pithoragarh have to face a lot of inconvenience as the heavy snowfall last night has caused a road blockage at the Kalamuni mountains. “The snow-cutter machine with the department is not in a working condition; therefore, the department will have to arrange one or repair the same machine to open the road,” said AS Bisht, Subdivision Officer of the PWD. According to PWD sources, the road is likely to be opened in the next two days as more than 2 ft snow has accumulated on the Kalamuni crossing of the road linking the remote hill station with the district headquarter. “The people of Malla Johar face this sort of problem every year during winter as the snow cutter machine lying with the department remain in the non-working condition,” said Gulab Singh Pangti, president of the Malla Johar Vikash Samiti, Munsiyari. According to the meteorology unit of the ITBP , the peaks of Chiplakedar, Khalia Top and Kalamuni have witnessed more than 3 ft of snow in the past five hours and the valleys of Byans on the Kailash Mansarowar route have witnessed more than 5 ft of snow in this sudden change of the weather. The Byans Valley has witnessed snowfall on Gala onwards, covering the adjoining mountains for the first time in this season. 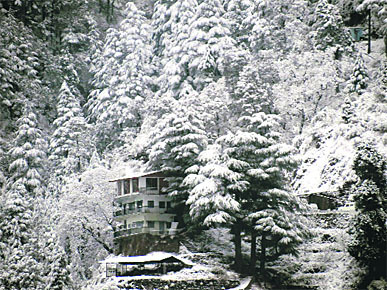 Nainital: Apart from the higher reaches, the town too witnessed snowfall, although the snow melted as fast as it fell in the main town. The areas of Cheena Peak and Kilbury Road witnessed a heavy snowfall. The tourists made a beeline to the Kilbury Road. The roadside stalls in the town selling woollens did brisk business throughout the day. This was the second snowfall of the season in the town. The Punjab team won the 26th Banke Lal Shah Under-15 Memorial Cricket Tournament by defeating the Purvanchal Cricket Academy, Benaras, by eight wickets in the final match here today. After winning the toss, the Punjab team elected to bowl first. In the first innings, the Benaras team scored 49 runs all out. Rohit was the top scorer with 15 runs. Raghav and Harpreet took two wickets each for the Punjab team. Responding to the score of the first innings, the Punjab team made 52 runs at the loss of two wickets. Openers Abhinav and Marshal contributed to the team’s victory with 26 and 17 runs, respectively. Chaudhary Avdhesh Kumar, president of the Uttarakhand Volleyball Association, who was the chief guest on the occasion, congratulated the winning team and gave away the prizes. 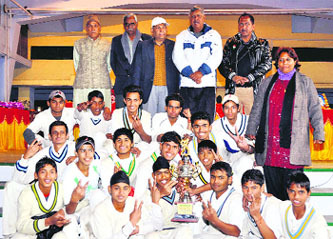 Sukhpreet and Abhinav of the Punjab team were declared the best bowler and the best batsman, respectively. Sanjay from MCC was declared the best fielder while Vishal Roopani of the Benaras team won the best wicket keeper title. Abhinav of the Punjab team was declared as the man of the match. The police reached the hotel, arrested the PSO and recovered the pistol and its licence from him. According to the police, the children of renowned jeweller from Delhi staying at a hotel in Mussoorie from January 5 were enjoying snow when a glass fell on the road below a shop at Kulri Bazaar. The enraged shopkeepers then entered the hotel and sought an explanation in the matter but the PSO, who is alleged to be in drunken state, pointed his pistol at the shopkeepers threatening them with dire consequences. The enraged shopkeepers then entered an arguments with the PSO and were calmed down only after the intervention of the police who apprehended the PSO and brought him to police station. The local shopkeepers also alleged that the police was siding with the tourists who belonged to a rich family and was not showing any interest in registering a case. The PSO has been identified as Kulbir Singh, resident of Haryana. 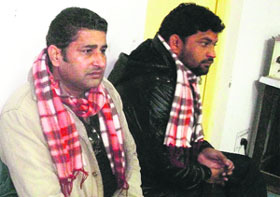 The children of the jeweller from Delhi had also been brought in to the police station for further questioning. According to police station in charge Parikshat Kumar, the PSO has been apprehended and has been sent for medical examination. A case will be registered only after detailed investigation, added Parikshat Kumar. On the other hand, the PSO said the children who were playing in the snow dropped a glass on the road after which the enraged mob entered the hotel and started thrashing them and when he rushed to defend them he was beaten thoroughly. Kulbir Singh denied threatening them with pistol as alleged. Hotel owner also said the local shopkeepers manhandled him too and he managed to escape from their clutches only after police intervention. It was also found that pistol was not registered in the hotel registration arms and conveyance section of the hotel entry register. United Progressive Alliance Chairperson Sonia Gandhi will be in the state on January 15. According to Congress sources, Sonia will be addressing a public rally at Boraree Stadium in Tehri Garhwal district on January 15. The rally holds much of the importance as Sonia had failed to make it to the Haldwani Congress rally in the Kumaon region of the state on January 4 due to inclement weather conditions. Congress leaders in Tehri are hoping that Sonia’s visit to the region will boost party’s electoral fortunes in the Garhwal region of the state. Thanks to crusader Harak Singh Rawat, Additional Mukhya Nagar Adhikari (Additional Chief Executive Officer), Dehradun Municipal Corporation (DMC), the situation in the cities where ever he worked has changed for the better. These days he has also been given charge of election affairs of Rajpur Road and is leading the drive to remove illegal hoardings/banners defacing the city walls and trees. He has been instrumental in propelling people in planting thousands of walnut trees in Srinagar, Kirtinagar, Tehri where he worked in different capacities. He has also been at the forefront in removing encroachments, be it 350 kiosks in Tehri in one go, rehris from the bazaars or hutments from slum colonies in Dehradun. Taking a cue from his passion to serve society, villagers around Baigul river at Udham Singh Nagar dug land up to five metres around the river at his behest and straightened the course of the river, which otherwise had changed its direction and was causing floods in the villages. The government assistance of Rs 2 crore asked for the same project came late but was utilised well to build a concrete embankment around the river. But the timely action plan implemented by Rawat helped in minimising the massive damage triggered by the floods every year. would then be either recycled or used for composting likewise,” he said. To ensure that his mission continued ever after he left, he constituted committees with heads of local bodies and workers, which are functioning well now. As SDM, Kirtinagar, in year 2007-08 and Tehri in 2008-09, he rode on success by replicating the same experiment. His reputation of doing good work brought him to the Municipal Corporation of the capital city but the strong union culture and idle sitting attitude of sanitary workers spawned problems for him. The workers stood against him on one pretext or the other, banking upon political patronage. Rawat’s patience paid off and everything fell into line. Yati won the bronze in the short track ice skating 500 mts while Ashwin Raj and Abhishek won gold and bronze in figure skating, respectively. All three of them represented the state as the state ice skating team and won 3 medals in the championship. A total of 550 ice skaters participated in the long, short-track races and figure skating events from Uttarakhand, Maharashtra, Rajasthan, Calcutta, Andhra Pradesh, Uttar Pradesh, Jammu & Kashmir, Himachal Pradesh and Karnataka. Gupta, present on the occasion, congratulated the participants and announced that winners of the short-track races would take part in the ISU World Cup Short Track Speed Russia Championship in Moscow from February 3 to 5, and in Melbourne, Australia, from February 24 to 26. The winners of the figure skating event will qualify for 7th Malaysian National Figure Championship to be held on February 17 and 18 in Malaysia and from March 6 to 11 at the Hague, Netherlands. According to sources, the Indica (UK 07 C 0577) was on its way to Srinagar from Rishikesh when the accident took place at 12.30 pm today. The deceased have been identified as Dhanpal (32) and Ram Kishore (27) . The bodies have been sent for a post-mortem examination.